It's come to my attention that I forgot to post a photo of the blocks I made for the November installment of Sew.Quilt.Give. I'm really curious to see how this one is going to look all put together. 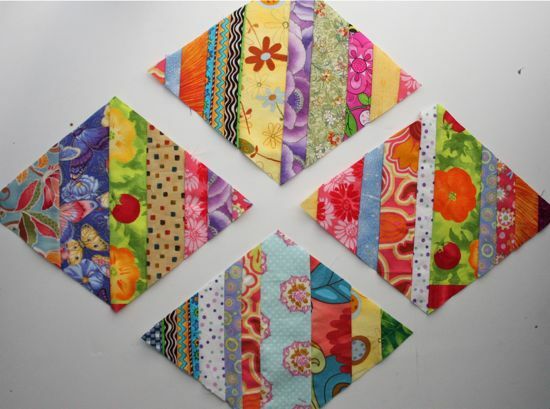 These are super simple to make and could be a bit of a stash-buster if you were feeling scrappy (or if you have a larger/more diverse scrap pile than I do). Would strips in spectrum-order end up too cutesy? 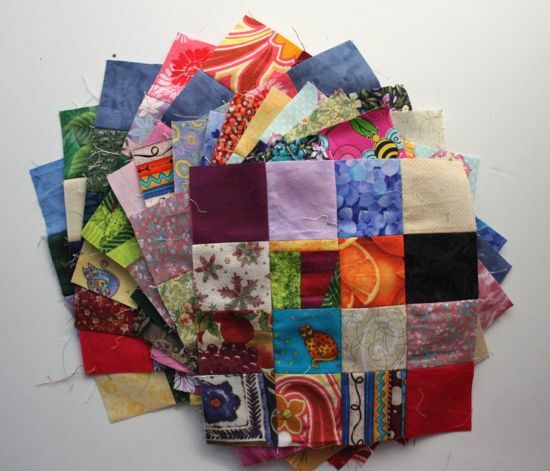 Speaking of Sew.Quilt.Give., Marian has finished the quilt from July's blocks. My blocks are still more saturated than everyone else's but at least they aren't yelling quite as loudly as some of the previous blocks. 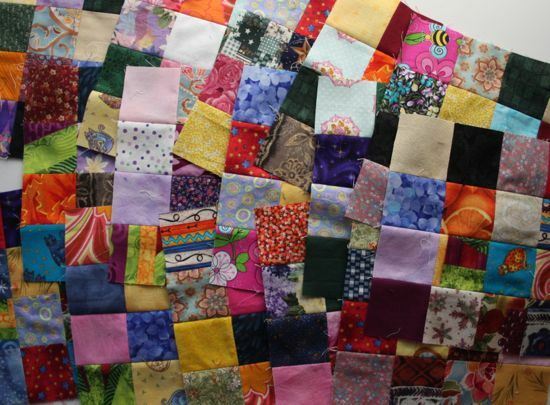 Sew.Quilt.Give. took the month off in December. Instead, I made up a small stack of postage stamp blocks for a swap. This is a scrappy postage block set, unlike the last one. Scrappy postage stamps are also good scrap-busting; I just don't know that I'm totally sold on the scrappy part. I really like the light/dark checkerboard of my other postage stamp quilt, although if you took the time and did the planning, you could do that with scraps. Just not sure it appeals to me. Given that, I'm not sure yet what I'll do with the 16 blocks I'll be getting back, probably in a couple of months. At the moment, I'm amused by the idea of pairing them with the siggy blocks from the summer's swaps. Guess I'll just have to wait until the blocks show up!